Victorian Pennies is a top-down triangular shawl which starts with Judy’s Magic Cast-on. The Victorian Pennies Pattern flows into the border and the shawl is finished with an Estonian Cast-off. The variety of increases and decreases used to produce the reverse stocking stitch circles and surrounding halos in Victorian Pennies makes for an interesting knit. While patterning occurs on both right-side and wrong-side rows, wrong-side row stitches are limited to knit, purl and knitting 3 stitches together. 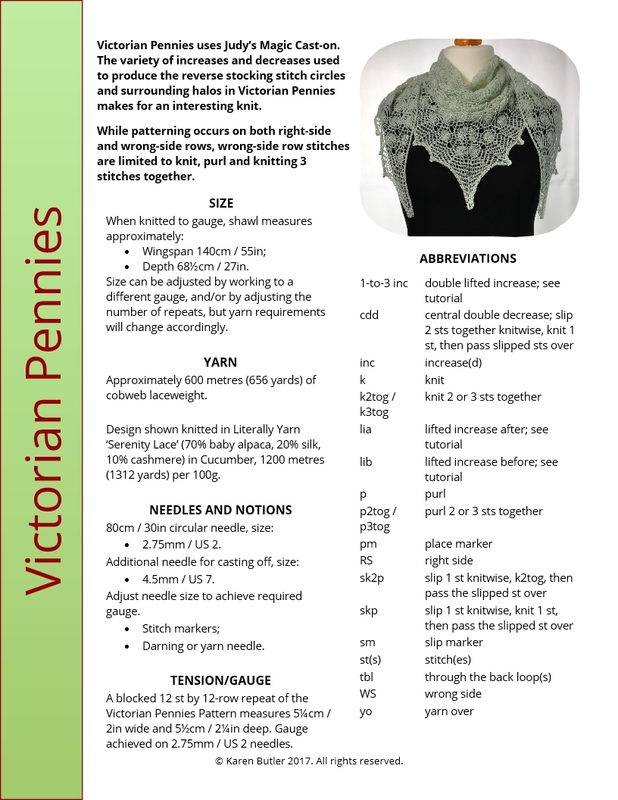 Both written instructions and charts are included for all lace patterns; with written instructions only for the start of the shawl. Photo tutorials are also included for the lifted increases used in the pattern. Note that the pattern is travelling, so stitch markers CANNOT be used between pattern repeats. depth 68 1/2cm / 27 in. Yarn requirements are for the weight of yarn and number of repeats stated at the given gauge. Information is included in the pattern to allow adjustment of shawl size, which may also be useful if you use an alternative yarn weight and/or gauge. 80cm/30 inch circular needle in size 2.75mm; additional needle in size 4.5mm for casting off. 2-ply or lace weight yarn with 1200m/1312 yards per 100g. Tension 12 stitches and 12 rows in in Victorian Pennies lace pattern after blocking for 5 1/4 cm /2 inch wide and 5 1/2 cm / 2 1/4 inch deep. stitch markers, darning / yarn needle. Design shown knitted in Literally Yarn Serenity Lace (70% baby alpaca, 20% silk, 10% cashmere) in Cucumber, 1200 metres / 1312 yards per 100g. They yarn used is hand-dyed Literally Yarn which is only available in small quantities in any colour. To substitute, choose a smooth lace weight yarn of about 1200 metres / 1312 yards per 100g. Using a heavier lace weight yarn will require more yarn.